We are closing in on one of our biggest events of the year, the “Concours De Nice” Car Show and Gala Reception! 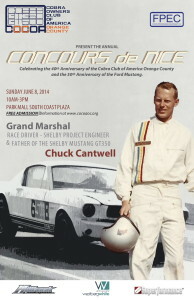 Our event, which will celebrate our club’s 40th Anniversary and the 50th Anniversary of the Mustang, will be held on Sunday, June 8, 2014 at the Park Mall at South Coast Plaza with the Gala Reception for our Grand Marshall –Chuck Cantwell on Saturday evening, June 7, 2014. The Gala will again be held at the fabulous Superformance/Hillbank Motors facility at 6 Autry in Irvine, CA. Please send your Concours entries directly to Hank Jesch, our Concours Chairman and don’t forget to RSVP Online for the Reception. As a paid Concours participant (plus Significant Other) your entry includes the GALA/RECEPTION. We would to cordially invite all other COCOA OC members and their friends who are not Concours participants, to join us at the GALA/RECEPTION on Saturday night. The cost is very reasonable at $10 per person (Payable at the door) for a great evening of food, refreshments, camaraderie, and mingle with our Grand Marshall, Chuck Cantwell!! You can RSVP online. I just found out about the event on Sunday, June 8th at South Coast Plaza, and would love to come and meet everyone. As a new Mustang owner, this would be just fantastic to see. I live in Orange County and know exactly where South Coast Plaza is, I just don’t know where the “Park Mall” is located. Can you tell me exactly where the Park Mall at South Coast Plaza is and how to get there? Thank you so much for your help and hope to see you there.